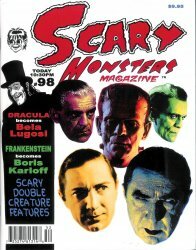 MyMovieMonsters.com > Scary Monsters Magazine > Scary Monsters 1-100 > Scary Monsters magazine #98 - Bela, Boris, Gamera! The latest and gravest from Scary Monsters magazine. This is the June 2015 issue #98 celebrating Bela Lugosi, Boris Karloff and Gamera cover by Terry Beatty. Monster Fest Eleven was Sheer Spooky Heaven! Full color cover and vintage B&W content. 100 pages including cover.